From the Soul Coach — Conversations that propel you forward. I was awakened early today because the Lord put my family and the people on this trip on my heart. I especially remembered my daughter who is moving this weekend without my presence. It was encouraging to spend time taking each one to Him in prayer, asking Him to meet them in this moment, to draw near to them, to reveal His way forward for each one. I don't know the reasons, but I am grateful to my Creator for giving me a heart of encouragement and care for those around me (unless they are in my way on the road--I'm working on it!). It has powerfully shaped my pastoral work. Interceding for others is such an important discipline, to live in a way that depends on God alone, moment by moment, to care for us in ways we never could for each other. Every one of us has needs that can lead us into the intimate presence of our Lord, and being in Jerusalem has certainly reminded me of my own need to draw near to the One who knows me intimately. More on that in the coming days. How to describe this day? I don't really know, but here are some highlights. We would spend the day in the city of Jerusalem, visiting sites that are revered by people around the world, so we dressed accordingly. We began on the Mount of Olives which reflects the religious congestion typical of this culture. Every group imaginable has a shrine or church or memorial to commemorate some facet of Jesus' life, death and resurrection. Of course, this hill is where the scriptures attest to His ascension and return as well. But when you are able to look past the busyness of the religious frenzy, what you will see is a city in conflict, like a song that needs to resolve into harmony. Our day together began on the bus with a devotion on Romans 12:14 and the instruction to bless rather than curse. Great prayer: may we not only walk where Jesus walked, but also as Jesus walked. 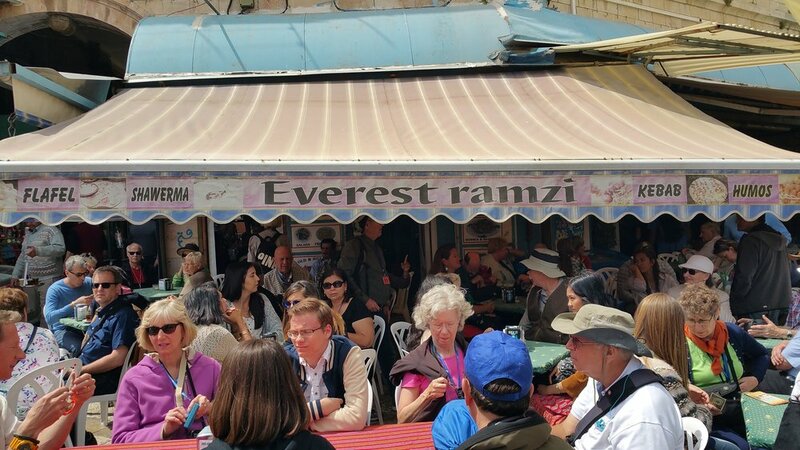 We parked on the Mount of Olives overlooking the Temple Mount and took time to talk about all of the sites around the city. The weather is windy and chilly this morning. As we gazed at the Temple Mount we talked about Abraham and Isaac as a foreshadowing of Jesus as the Lamb of the world 1800 years later. Some scriptures to contemplate: Matthew 21:1-11; Ezekiel 10:3-4,10; 11:22-25; Psalm 118; Luke 19:45; 21. We then walked to the Church of the Agony and what is likely the Garden of Gethsemane where Jesus wrestled in prayer over His decision to die for the sin of mankind. This was a place of frequent prayer for Jesus, but it was also a place where he showed his power. Some scriptures to contemplate: Luke 22:39-46; John 18:1-14. We walked a bit further to another garden area above the Kidron Valley where we spread out around the garden to draw near to the Lord in prayer. It was a beautiful time in His presence, interceding for those on my heart. A funny story: I found a big rock to sit on and as I looked down to sit I saw a snake looking up at me. It was a small snake, and probably as startled as I was, but we still went our separate ways. Imagine that... finding a snake in the garden. Sounds familiar! From there we crossed the Kidron Valley and ascended the many steps up to the Lion gate, trying to to avoid being hit by traffic. We then visited the Bethesda church and the Pools of Bethesda (see John 5:1-16). Note: we got to be here on Sabbath! After lunch we walked to the Church of the Holy Sepulchre, the likely location Jesus' death, burial and resurrection. Words are insufficient to describe my emotions upon seeing it. But I found myself feeling both wonder and disgust. As time has passed, the perhaps innocent desire to commemorate Christ has become nearly a worship of the place rather than of the Person. I sense God's Spirit would have it be much simpler and Christ-focused. While in the church building, not far from us at the Damascus gate, a Palestinian youth stabbed two Jewish youth and was quickly shot dead by police. It was all handled so efficiently that we didn't even learn about it until later. We are made to worship, but history proves that we tend to make a mess of it. As we sample the evidence from ancient Israel, one cannot deny the obvious: Israel was unfaithful. They were called to worship the one true God, but they too easily welcomed pagan practices from the cultures around them. This compromise led to destruction. Repeatedly. The same could be said of us. Rather than honor Jesus as God the Son, the only one worthy of our worship, we take the simplicity of that truth and devote our attention to building and maintaining our shrines and churches and monuments. It's not that those things are wrong, it's that they distract us from what matters most: Jesus. Have you noticed how, with time, a simple home improvement project can begin to take on new problems, adding complexity and cost? If you're not careful, those compromises can dilute the original plans and ruin the process. The question I am asking myself is this: is Jesus enough? And I believe He is. Today we packed up our things and said farewell to lush green Galilee. One comment I have repeatedly heard from my tripmates is that they are surprised by the beautiful, green landscape of Galilee. Our journey today takes us to the center of the Jewish world, the great city of Jerusalem. But the shift from Galilee to Jerusalem is abrupt and jarring. Today we learned that 62 percent of Israel is desert. So our trip would take us from one extreme to another. You may be interested to know that Israel is about the same size as the state of New Jersey. Putting that into perspective, that means that you can drive north to south in about 5 hours, and east to west in about 45 minutes. I hope I'm being accurate enough here to illustrate the fact that this is a tiny country. So, the desert occupies a large chunk of a tiny space. Our route today follows the Rift Valley along the Jordan River. On the east side of the river is the border fence that defines the West Bank and the border with Jordan. All day we look across the barbed wire and into the country of Jordan. We arrive at a major site, an ancient city known as Bet She 'an. This site represents 7,000 years of civilization and history, but archaeologists have unearthed and preserved a simply spectacular city from the Roman era. Bet She'an had at the time perhaps 40,000 residents making it the third largest city in ancient Israel. As one of the ten cities known as the Decapolis, Bet She'an represented Rome in every way imaginable. There was a theater, bathhouse, agora, Roman temple, public lavatories, amphitheater, hippodrome and more. It is simply massive in scope. The city was ultimately destroyed by an earthquake, but it has a long and significant biblical history prior to that. Israel's first king--Saul--suffered for his disobedience to God and was put to death by the Philistines and the bodies of he along with his sons were hung on the walls of this city. Later king David would take the city and it would become an administrative center for king Solomon. But later still during the Roman era it was simply a grand statement of Roman pagan values, standing in contrast to everything Jesus taught. To learn more, go to http://www.jewishvirtuallibrary.org/beit-she-an. By the time we left Bet She'an the sun was out in full force and things were heating up. Since we were on the road, arrangements had been made in advance to supply everyone with a box lunch, a beach towel, and two hours to enjoy swimming and picnicking at a park nearby that featured a natural lagoon, waterfalls and abundant shade and seating. After being refreshed we continued our journey southward along the Jordan River until we came to the most likely site at El Yahud for the baptism of Jesus by his second cousin, John the Baptist. The river literally forms the only barrier dividing the territorial rights of Israel and Jordan. Several asked to be baptized as a reaffirmation of their personal faith in Christ and desire to walk with Him in obedience, and one especially was baptized following a process of discovering the Bible's message, placing her faith in Christ, and eventually leaving the LDS church. These decisions don't come quickly or easily and each one affirmed their personal faith in Christ. For the group it was an intimate and meaningful time of bearing witness to their actions and celebrating with them this amazing and gracious gift we have been given in Christ. To learn more, go to https://www.facebook.com/pages/Qasr-el-Yahud/280458021986238. As we drove our guide Jacov sharpened our Hebrew language skills with a few simple phrases such as "boka tov" (good morning), "leila tov" (good evening), "shalom" (hello, goodbye, peace), "shabbat shalom" (on Sabbath), "slicha" (excuse me), "be vaka sha" (good sabbath weekend), and "toda" (thank you). We arrived safely in Jerusalem in the late afternoon, arriving from the east, desert side. From the Dead Sea up to the city of Jerusalem is a rise in elevation of about 4,000 feet. Tomorrow: we explore the city itself. Compromise leads to catastrophe. As we drove the remaining miles toward Jerusalem we could see the harsh desert landscape that forms what is known as "the wilderness" in the gospel accounts of Jesus' life. This is a barren, forsaken place. Modern war and ethnic strife have left it to be almost frozen in time. Chapter 1 in the book of Judges tells us that Israel did not drive out the Canaanites as God instructed, which at the time seemed perfectly sensible. The only problem is that this decision to operate independently of the Lord led to a failure to completely remove opposing belief systems in the area. 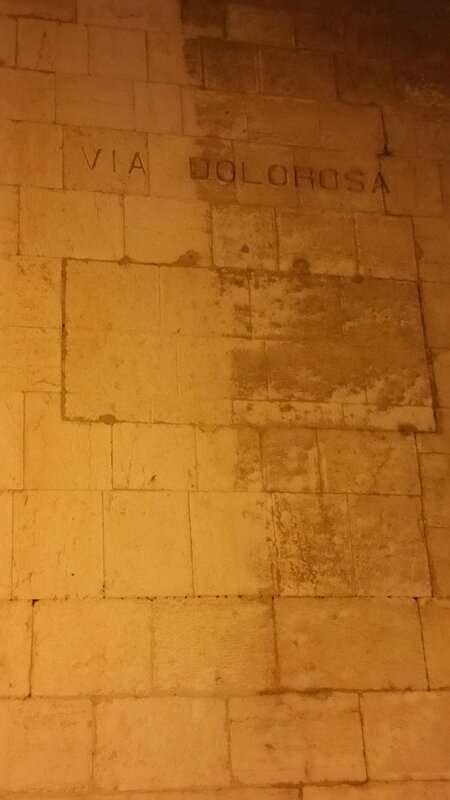 Eventually and ultimately, king Saul was hanging on a pagan wall. I reflected on this simple compromise and how it led to hundreds of years of unnecessary war and strife. At the time, a small compromise seems so innocent and uneventful. But we do so to our detriment because we cannot possibly understand the implications of those errant choices. It occurred to me today as I gazed on the lifeless wilderness that Jesus made no such compromise. He left His home village of Nazareth, traveled a very long way to find John the Baptist, chose baptism to inaugurate His next steps, and intentionally walked into the barren abyss of the wilderness to be tested for forty days. From there Jesus gathered His followers and began to announce God's kingdom with authoritative teaching and miraculous signs that took everyone by surprise. These are not the actions of someone who is toying with an idea. This is not a casual decision. No, Jesus makes a choice to complete what His heavenly Father sent Him to do, and that meant every step, every word, every compassionate touch was an intentional act of a man on a mission. It makes me wonder how we as Americans might learn to lean away from comfort and lean into courage. Certainly the cultural landscape is looking more barren, so I wonder how we will declare our intentions to live on purpose? Our next day began with a journey to ancient Sepphoris, the Zippori National Park. The large city near Jesus' hometown, where Mary's parents lived, was a very Roman and pagan city, a place of spiritual darkness even while religious activity is all around. This place was home to the rabbi who developed the Jewish Mishnah, Rabbi Judah Hanasi. His move to Zippori also brought with him the Sanhedrin, the highest institution in Jewish law. There are many significant locations at the site: an ancient water reservoir, a large agora (marketplace), a Crusader fortress, a mansion called the Dionysus House where a beautiful mosaic of a beautiful woman is preserved in the floor, often referred to as the "Mona Lisa of Zippori." The most significant relevance though for this city is its relationship to the village of Nazareth. Just down the hill from that village, Sepphoris is the hub of activity and trade where Joseph and young Jesus would have spent time, found work, and experienced the life of the community. The cardo (main roadway) is a magnificently preserved street that Jesus likely walked many times. To learn more, go to http://www.parks.org.il/sites/English/ParksAndReserves/zippori/Pages/default.aspx. From Sepphoris we made our way up to Nazareth, the town with the largest Arab population in Israel outside of Jerusalem. The strong Muslim presence does not prevent the local population from finding ways to capitalize on the birthplace of Jesus, though. The suggested home of young Mary, the mother of Jesus, is completely dominated by the Church of the Nativity, a beautiful structure that unfortunately overshadows the simple significance of Jesus' birth. We had a delightful tour through the Nazareth Experience, a well-done, historical walk through the significance of Jesus' birth, death and resurrection complete with empty tomb hewn from bedrock. While it is staged, the guide was delightful and skillfully wove the story of the good news about Jesus throughout the experience. 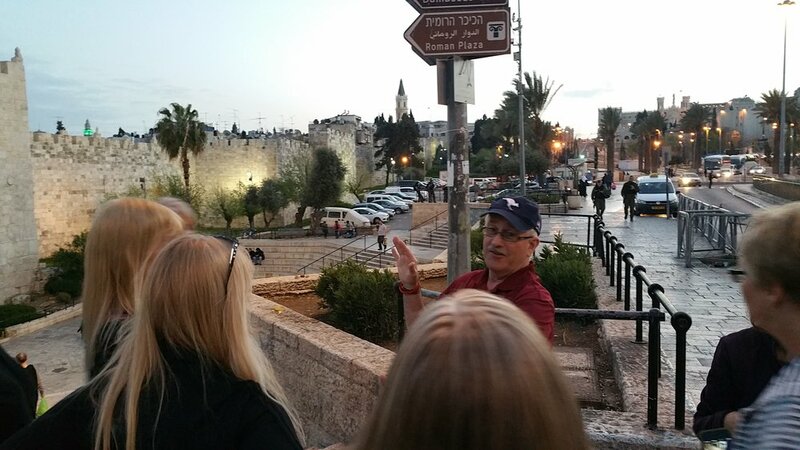 As we learned later, our guide is from Russia, spent several years in the USA, was introduced to Jesus while there, and today participates in a small messianic Jewish community in Nazareth. Let's remember to lift these brothers and sisters in prayer as we consider the challenges of living our faith in the world. To learn more, go to http://www.nazarethvillage.com. We did something really cool today, an adventure that is unlike any other study trip: we traveled by 4x4 to what is thought to be the ancient site of the village of Cana where Jesus performed His first recorded sign. The reason other tours don't consider this site is in part because it is not accessible by tour bus and thus unlikely to gain much traffic. In 2011 archaeologists worked the site, took aerial photos defining the city, and then abandoned the project. If you were not aware, there are hundreds, perhaps thousands, of viable archaeological sites waiting to be unearthed that will remain dormant simply for lack of resources. The work that is being done is phenomenal, but it is only a fraction of what could be done. The original Cana site is one of those places that will likely continue to exist in anonymity. But our team made the trek, surveyed the site, and enjoyed the thrill of being tossed around inside an all-terrain vehicle (if you like that sort of thing!). To learn more, I hope to post a website here very soon. We were reminded today that Jesus lived among pagan people yet did not compromise or syncretize with pagan ideas that saturated His community. While spiritual confusion and darkness exist, Jesus shows us what it means that we become "the light of the world" just as He is the Light of the world (Matthew 5:14). Just as the moon revolves around our sun and reflects the intense light emanating from it, so we are called to be reflectors of the glory of Jesus. When we live among the darkness yet persist in reflecting His light and life, the shadows and corners cannot hide. I am not expected to live a life good enough to be like Jesus as much as I am called to be the lamp in which Jesus shines. May that be one way I measure my thoughts and actions each day. Interestingly, from a young age I have chosen Matthew 5:16 as my life verse: "In the same way let your light shine before men that they may see your good deeds and praise your Father in heaven." Lord, make it so. Fun Fact: Tour guide Jacov likes to refer to McDonald's restaurants as the "MC Shrine." We woke up today to beautiful weather for a boat ride across the Sea of Galilee. We boarded the "King David" and launched out into the Sea, enjoying a time of reading scripture and spending time alone in prayer and silence. We even enjoyed seeing a demonstration of how first century fishermen would cast nets. We also learned that the "St. Peter" fish is actually tilapia, the most common fish in the Sea, and is only found here and in Lake Victoria in Africa, at the terminus of the Jordan River. Sadly we discovered that most tilapia are now grown in fish farms rather than being caught in the Sea of Galilee. After crossing to the other side we visited the museum featuring the replica of a fishing boat found in the Sea of Galilee in 1986. This was one of those sites I had hoped we would see and wasn't disappointed. This first century boat is quite a bit smaller than the vessel we traveled in earlier. To learn more, go to https://www.thegalileeboat.com/. From the seashore we traveled up the basin to the area believed to be the location of Jesus' sermon on the mount, now commemorated by a Roman Catholic church called "Church of the Beattitudes.' While a beautiful facility, I found it especially satisfying to simply sit with our group, read the scripture, and take some time to enjoy the simplicity of the view over the towns and Sea below. What is clear is that what Jesus spoke is a new way of living, a life that is possible only through a personal relationship with Him. But what hope and encouragement we can have from Him. To learn more, go to http://www.beatitudes-sb.org/. We also were able to visit the site of Chorazin, located about 3 miles from Capernaum, one of the placed Jesus cursed for their lack of faith (Matthew 11:20-24). To learn more, go to http://www.bible-history.com/geography/ancient-israel/chorazin.html. Traveling down the hill again we visited a church in Tabgha which stands at the location believed to be the site of the miracle of feeding 5,000 men plus family members. The church of Loaves and Fishes conains some beautiful floor mosaics and the foundation stones for an early church in that area. 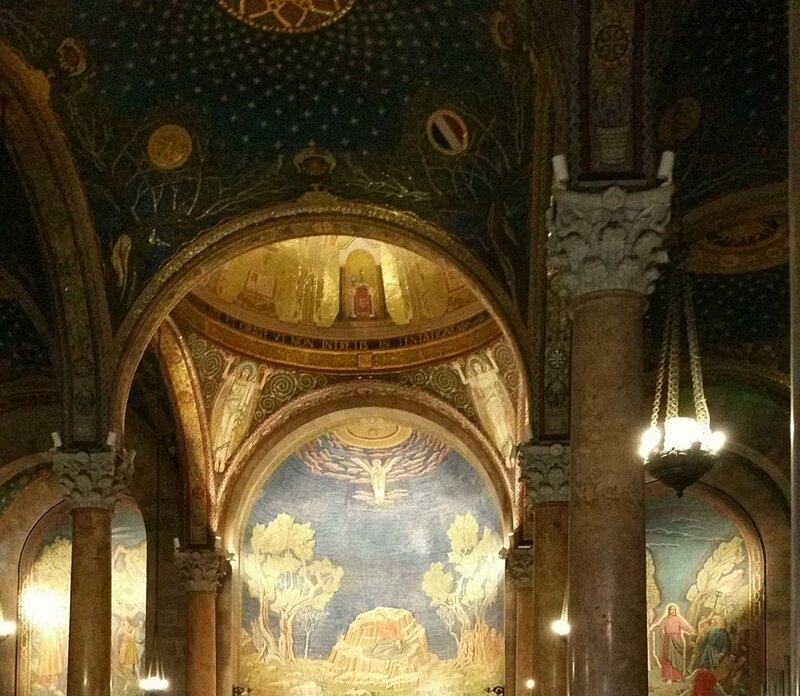 To learn more, go to http://www.sacred-destinations.com/israel/church-of-loaves-and-fishes. We enjoyed lunch at a gas station. Yes, in countries like Israel there are restaurants associated with gas stations which provide delicious meals like the one we shared. In addition to the hummice and vegetables and pita bread, we were seved chicken, filet of bass, or fish baked in whole. Didn't see a lot of people making the last option, though. After lunch we made our way up the road to Capernaum, the base of ministry for Jesus after leaving Nazareth (Matthew 4). Here we explored a well-preserved synagogue, many interesting pieces of inscribed stone, and perhaps the very house where Simon Peter lived with his family. The evidence is compelling but incomplete. To learn more, go to http://www.capernaum.custodia.org/default.asp?id=5389. I was able to share from God's Word about the many ways Capernaum played a significant role in Jesus' ministry. In particular I focused on three lessons: (1) Matthew 10:2-4 and 9:9-13 reveal the fact that Matthew (a tax collector for Rome) and Simon the Zealot (a hater and activist against Rome) were both selected by Jesus to be part of the Twelve. What a great reminder that Jesus intends for us to focus not on our differences but on Him and the Gospel which unites us. (2) Mark 1 tells the story of Jesus leaving ministry "success' behind to pursue a greater purpose after spending time alone with His Father in solitude and prayer. This reminds us that it is not our job to be successful in ministry or to fix everything, but instead to spend time alone with our Father to know what He is calling us to do next. (3) Mark 9 centers around a question Jesus asked the Twelve: "What were you arguing about?" Of course, the question was awkward because in truth the men had been arguing about which of them was the greatest. This led to His lesson that greatness is not what we think. I am reminded that greatness is not what God looks for from us, but to recognize that only God is truly great and when we humble ourselves and allow Him to be seen in us, then we truly reflect His greatness through humility. Our final stop was the town of Bethsaida where we were able to walk through the remains of this cursed town. To learn more, go to http://bibleatlas.org/bethsaida.htm. Today has been a bit slower pace which is a welcome change. For fun tonight several of us went out looking for dinner and found a lovely spot at "Mamma Mia" where we enjoyed pizza and sorbet. Because it was kosher food, the pizza had no meat on it. God is not impressed. We can’t “wow” Him. We bring nothing to the table except for one thing: a humble heart. When I am wrapped up in my need for greatness, when I am so insecure that I have to compare myself with others and feel significant, then I am of no use to the One who is truly great. When my focus is on me I have no vision for what God wants. But when I choose to let Jesus reveal His servant heart through me, that’s when God delights to show His power and His glory. The secret to living the life of following Christ is revealed in Colossians 1:27-29. Christ in you. His energy at work through you. Our third day together took us north of Tiberias, passing the town of Magdala (what is today Migdal) where we would return later in the day. Driving around the western shore of the Sea of Galilee we made our way to Tel Hazor, a huge city (the largest ancient Canaanite city known) on the Via Maris, the road between Egypt and Syria that was destroyed by fire (see Joshua 11:11). The excavations at this active dig have unearthed an Israeli tower used for lookout until the Assyrians captured the city in 732 BC, and in older levels of excavation that reveal remains from the 15th century BC, corroborating the Old Testament accounts of destruction by Barak and Deborah (Judges 4). The palace of their king Jabin is being restored as well as gates from king Solomon of Israel. To learn more, go to http://micro5.mscc.huji.ac.il/~hatsor/. From Hazor we travled further north to the foothills of Mt. Hermon to the town of Caesarea Philippi, the northern-most destination we know Jesus to have traveled. This area is very close to Syria, located in the contested area known as Golan which was taken by Israel from Syria in the 1967 war. Caesarea Philippi is where the headwaters to the Jordan River begin, and there is a lot of water! The setting is simply breathtaking, and the significance of the site is even more amazing. The town is nestled up against a huge rock wall that dominates the whole area. Carved in the rock wall are niches where idols and temples were placed in honor to a plethora of gods including Pan, Hades, and many others. Why is that so important to know? Because after retreating to this remote area, Jesus took this opportunity to ask the important question: among all the opinions that exist, "Who do you say that I am?" (Matthew 16:13). After seeing many signs, hearing Him teach with authority, standing there as he was being opposed by religious rulers, and now being reminded of the "many gods" options within their culture, the disciples needed to sort out in their thinking what they really believed about all this. This question posed by Jesus still demands a choice. To learn more, go to http://www.bible-history.com/biblestudy/caesarea-philippi.html. We hiked for about a mile from Caesarea Philippi along the river coming from Mt. Hermon as we prepared to head further north. It was a beautiful walk through wooded areas along a trail, but it was challenging enough to create an appetite! Our next destination was Tel Dan, the ancient site of the tribe of Dan. You may have read in the Old Testament the description, "from Dan to Beersheba," which is one way of saying from top to bottom, the whole of Israel. Here we walked to a cultic shrine where king Jereboam made golden calves and constructed a "high place to worship other gods" complete with an altar and priest's housing. It is truly amazing to walk among these ruins from so many hundreds of years before Christ and see that even today we still make the same mistakes of choosing to worship what we want. To learn more, go to https://teldan.wordpress.com/. After surveying many places and sharing God's Word together, we finished our visit to Tel Dan by exiting through the Canaanite city gates to visit another set of ancient gates that date to Abraham's era and have been protected through the millennia. Truly remarkable! En route to our hotel we stopped to visit the recent discovery of Magdala and the only first century, Jewish synagogue that has been unearthed. We were greeted by Father Kelly, a gregarious and delightful priest from Ireland who walked us through the uniqueness of this site--complete with fish processing tubs and Jewish ritual baths--and introduced us to the Roman Catholic church that has been built on the shore of the Sea of Galilee. In the new basement chapel we learned that the stones used for the floor are the original stones from the 1st century port of Magdala. Regardless of our convictions about theology or your experience with Roman Catholoicism, it was evident that Father Kelly loves the Lord and his work there in Magdala. You can learn more at http://www.magdala.org/visit/archaeological-park/synagogue. At the end of a long day, we were all tired but ready to rest well in preparation for tomorrow. We live in a world of choices. And in our American culture we have been spoiled through consumerism to believe that it is normal to choose whatever we want. But in light of a sovereign God having revealed Himself through creation, His Word, and His Son Jesus, some choices may be wrong choices. How do we know what to believe about God? What is the evidence that He is real? What are the implications if Jesus is who He says He is? What our Father taught me today was to always recognize the importance of choosing to affirm what He declares to be true. I'm tired of all the opinions (even mine). Today I reaffirm my confidence in Him by faith. That's one choice I don't ever want to get wrong. Wouldn't it be helpful to read someone's story of belief, how they moved from well-educated atheist to well-educated Jesus follower? If you haven't, pick up a copy of Mere Christianity by C.S. Lewis.